The McCracken Research Library at the Buffalo Bill Center of the West suggests the following bibliography for further reading on Wild West shows. Blackstone, Sarah J. Buckskins, Bullets, and Business: A History of Buffalo Bill’s Wild West. Contributions to the Study of Popular Culture, Number 14. Westport, CT: Greenwood Press, 1986. Bold, Christine. Selling the Wild West Popular Western Fiction, 1860–1960. Bloomington: Indiana University Press, 1987. Buffalo Bill, and Frank Christianson. The Wild West in England. Lincoln: University of Nebraska Press, 2012. Collings, Ellsworth, and Alma Miller England. The 101 Ranch. Norman: University of Oklahoma Press, 1938. Clark, Sarah Wood. Beautiful, Daring Western Girls: Women of the Wild West Shows. Cody, WY: Buffalo Bill Historical Center, 1985, 1991 [Exhibit guide]. Cunningham, Tom F. ‘Your Fathers the Ghosts’: Buffalo Bill’s Wild West in Scotland. Edinburgh: Black & White, 2007. Delaney, Michelle Anne and Gertrude Kasebier. Buffalo Bill’s Wild West Warriors: A Photographic History. Washington, D.C.: Smithsonian National Museum of American History; New York: Collins, 2007. Erskine, Gladys Shaw. Broncho Charlie: A Saga of the Saddle. New York: Thomas Crowell, 1934. Farnum, Allen L. Pawnee Bill’s Historic Wild West: A Photodocumentary of the 1900-05 Show Tours. West Chester, PA: Schiffer Publishing, 1992. Gallup, Alan. Buffalo Bill’s British Wild West. Gloucestershire, UK: Sutton, 2001. Griffin, Charles Eldridge. Four Years in Europe with Buffalo Bill. Lincoln, NE: University of Nebraska Press, 2010. Edited and with an introduction by Chris Dixon. Hall, Roger A. Performing the American Frontier, 1870-1906. Cambridge: Cambridge University Press, 2001. Logan, Herschel C. Buckskin and Satin: The Life of Texas Jack…and his Wife Mlle. Morlacchi. Harrisburg, PA: Stackpole, 1954. Makharadze, Irakli. Wild West Georgians. Tbilisi: New Media Tbilisi, 2002. McMurtry, Larry. The Colonel and Little Missie: Buffalo Bill, Annie Oakley, and the Beginnings of Superstardom in America. New York: Simon & Schuster, 2005. Monaghan, Jay. The Great Rascal: The Life and Adventures of Ned Buntline. Boston: Little, Brown, 1952. Noble, James. Around the Coast with Buffalo Bill: The Wild West in Yorkshire & Lincolnshire. East Yorkshire: Hutton Press, 1999. Reddin, Paul. Wild West Shows. Chicago: University of Illinois Press, 1999. Rennert, Jack. 100 Posters of Buffalo Bill’s Wild West. New York: Darien House, 1976. Russell, Don. The Wild West, or A History of the Wild West Shows. Fort Worth, TX: Amon Carter Museum of Western Art, 1970. Rydell, Robert W., and Rob Kroes. 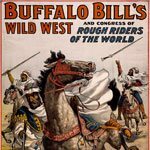 Buffalo Bill in Bologna: The Americanization of the World, 1869–1922. Chicago: University of Chicago Press, 2005. Sell, Henry Blackman. Buffalo Bill and the Wild West. NY: Oxford University Press, 1955; and London: Hamish Hamilton, 1956. Shirley, Glenn. Pawnee Bill: A Biography of Major Gordon W. Lillie. Albuquerque: University of New Mexico Press, 1958. Reprinted by Bison Books, University of Nebraska Press, 1958. Thorp, Raymond W. Spirit Gun of the West: The Story of Doc W. F. Carver. Western Frontiersmen Series VII, Glendale, CA: The Arthur H. Clark Co., 1957; also published as “Wild West” Doc Carver: Spirit Gun of the West. London: W. Foulsham & Co., 1957. Title varies considerably with publisher and edition. Turnbaugh, Kay. The Last of the Wild West Cowgirls. Nederland, CO: Perigo Press, 2009. Wallis, Michael. The Real Wild West: The 101 Ranch and the Creation of the American West. New York: St. Martin’s Press, 1999. Wallis, Michael. The Wild West 365. New York: Abrams, 2011. White, Richard, and Patricia Nelson Limerick; essays by. Edited by James R. Grossman. The Frontier in American Culture: an Exhibition at the Newberry Library, August 26, 1994 – January 7, 1995. Berkeley: University of California Press, 1994. Wilson, R.L., et al. Buffalo Bill’s Wild West: An American Legend. NY: Random House, 1998. Browse the Buffalo Bill Center of the West’s online Museum Store for in-print books on Wild West shows.